One of the main reasons why I bought a TiVo was because it would fit nicely in my A/V rack. 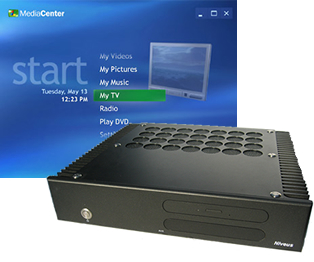 Niveus Media has released the AVX Media Center which measures about the same as a standard A/V component, just over 17 inches wide, and under 4 inches tall. It uses Windows Media Center 2004, which at first I was a little hesitant to like… but now that I use one, I’m actually a fan because of the all the future possibilities, think Portable Media Center than can dock to your MCE, ala iPod. The AVX can be configured, but expect a P4 2.4ghz, 512MB RAM, 80GB HD, and a Radeon 9200, with case to run you about $2499, or up to $3179 full loaded with 300GB of HD, a 2.8ghz CPU, 1GB RAM, and A Radeon 9600XT.